Due to an exigency, I had to make a sudden trip to Delhi in the beginning of this month and since then I am staying in Shri Aurobindo Ashram, the place of perfect serenity and calmness. The days are being spent in frenetic physical activities whereas the nights are calmer and quieter. There is hardly any time to meditate yet my mind is all the time connected to my inner source of constant peace and relief. Today is 10th Aug and it is morning and now is the little time I have to enter my new post. I have been raring to go, waiting for the tide and typhoon to calm down since I have stepped in this city. Nonetheless, I wish to blog and come up with something sane that will help me to concentrate and meditate on the focal point of my inner source. Although ideas have been pouring in but outside activities did not allow it to actualize. So every night I have been praying to God and surrendering my day and all actions at his Holy Feet because duties are important and we cannot overlook them. 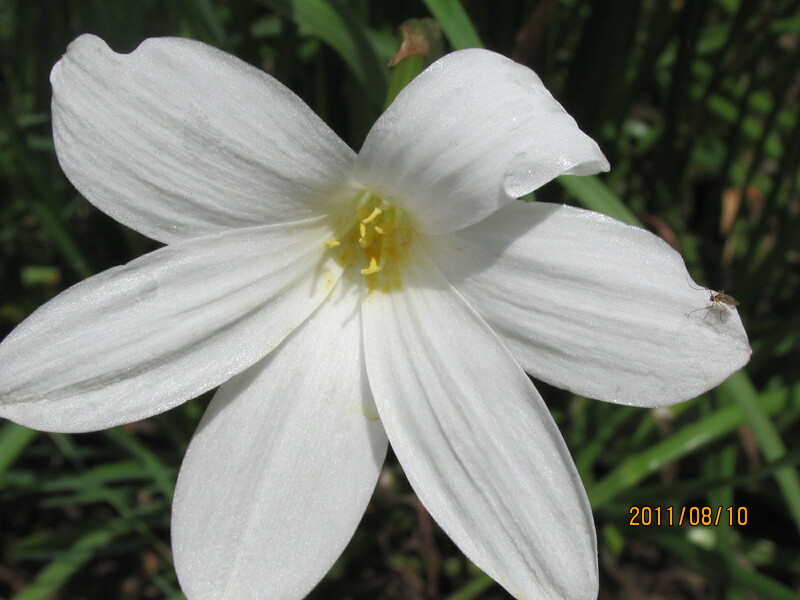 On the day I arrived here in the Ashram, as I closed my eyes to rest, I heard a very soft voice calling me to itself. The nights in the ashram are extremely quiet as it is sprawling and city noise does not reach one’s ears. It is a very restful place and any frail sound is audible, atleast to my keen ears. I could not only hear the voice of a Banyan Tree calling me but could also see it with my inner eyes and was sure that it is remembering me. 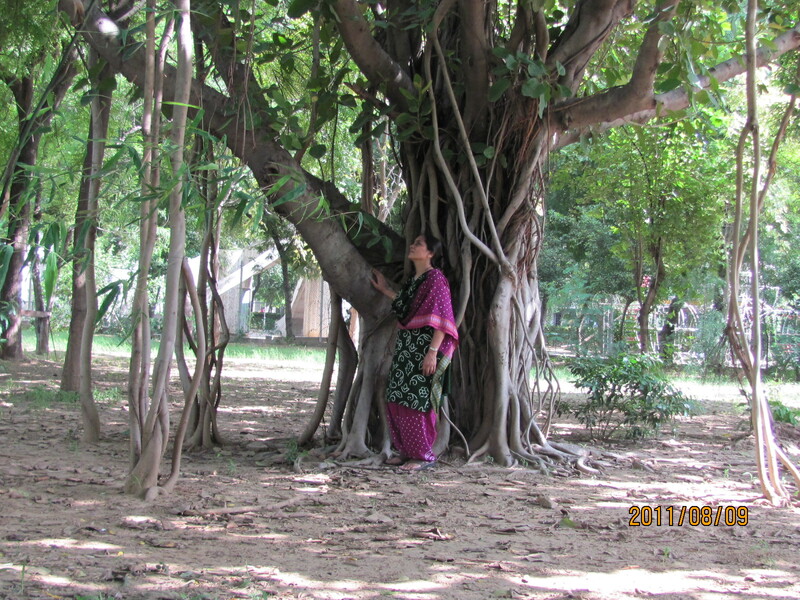 I was delighted at this development and also felt blessed that the sacred tree remembered me and wants me to pay it another visit like I did in December ‘10. 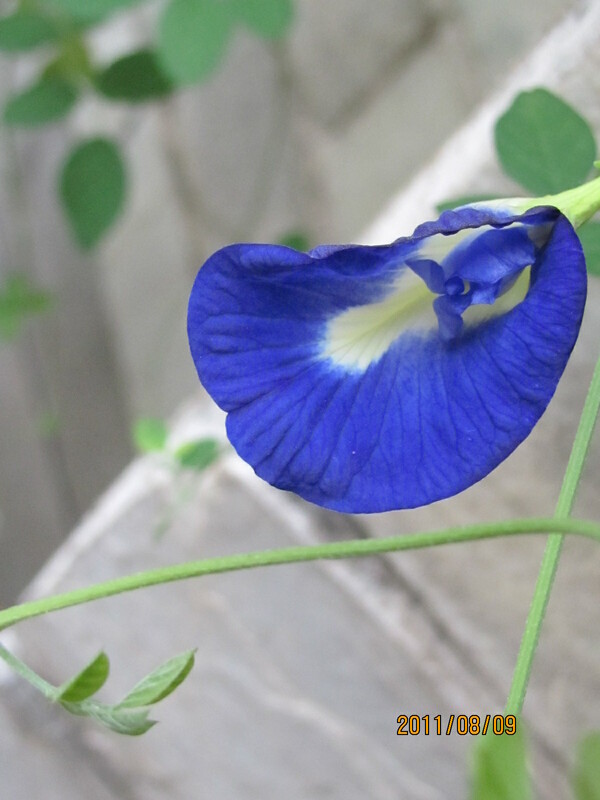 (Go to- The state of Super Consciousness-I) I also saw the inner view of the broad trunk of the tree from which a silvery beam of light was emanating. Seeing all this the weariness of the day dwindled and I wished to know more about the soul of the tree and wanted to communicate with it but the difficulty was that there was no time for all this. Anyhow, I was assured that at the right time God would definitely reveal to me my due spiritual lesson and it was just a matter of time for things to unfold beautifully. 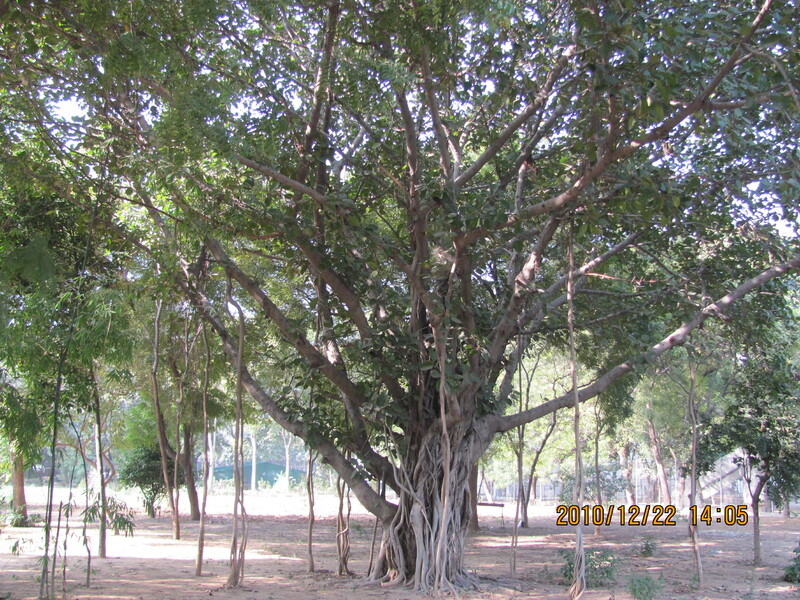 Two days back in the morning, I went to the site where there is this Banyan Tree in the Ashram. I prayed and paid my respect to the holy tree and spent quite a lot of time just being there and taking a few good pictures. 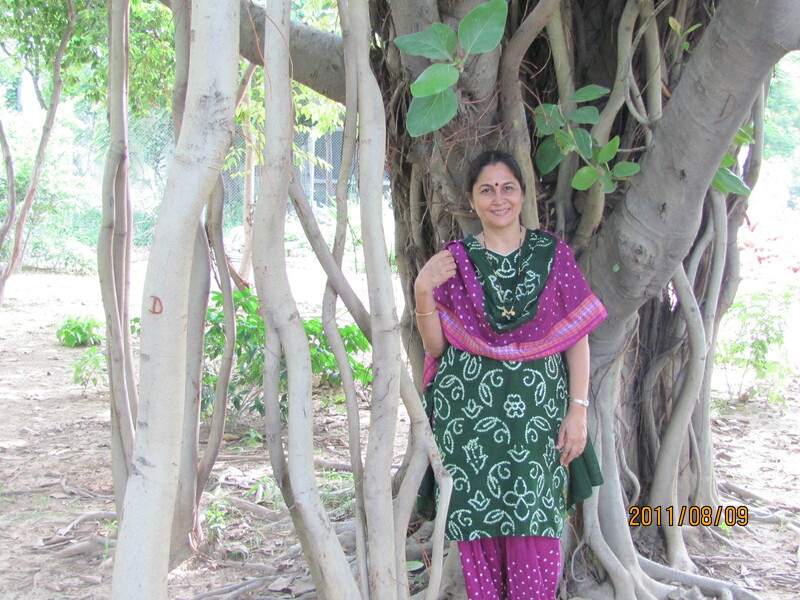 I revered the tree and in return received abundant energy, solace and blessings. Yet I could not really sit down to meditate to communion with it as there was lack of time. 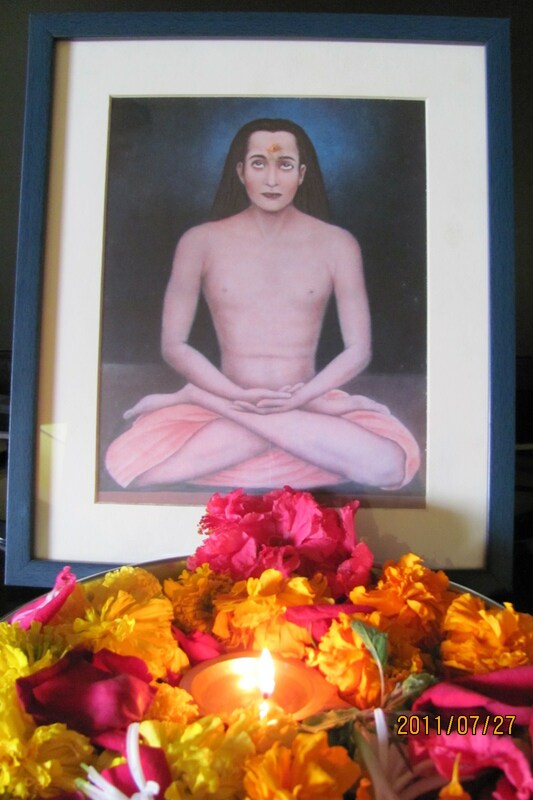 All these days while I was thinking about what and how should I blog during such times of commotion and complete uncertainty, I waited all along and had complete faith in my param Guru Shri Mahavatar Babaji who has never failed me and he is the one who guides this blog. I maintained my calmness and was positive that I will publish my new post before midnight of 10th August. Surely enough I woke up very fresh and energized today after I had a short dream in which I saw Babaji, who was in meditation as he sat under a massive Banyan Tree. Incidently this time he did not sit at the trunk of the tree but between the pillar-like numerous thick roots of the tree. I wondered about the symbolic meaning of this atypical view. Before I could even decipher it, He spoke to me in a very soft whisper, “I can see that you are mixing with all kinds of people and are suffering because you have to mix with people of very low mentality. This has caused depletion of energy yet you are firm and stable in your goal to enter a post without skipping the fixed date. The Banyan Tree here has already blessed you as you are serving me but since you had no time to devote to concentration, let me tell you that you will complete this assignment without any delay. Write another post on the importance of peace for a seeker because a seeker faces similar problems like any other person in the world but his approach to the problem is different. A good seeker will maintain his peace of mind because he is certain that no matter what sort of difficulty he is facing, his guru will always be by his side, no matter what. Although in special cases and particular times, the guru will remain silent because he will set aside some time for you when the karmic pattern of the concerned person is such that he must suffer for the past misdeeds. The guru allows his disciple to suffer little bit because he is teaching him silently to learn from his past mistakes. As soon as the disciple accepts his mistakes and regrets his bad deeds, the guru will send you the message that from now onwards, lead a pious and peaceful life. That is what I do to my children when I have to teach them an important lesson but very silently! Having said that, please know that I never leave my children, no matter what sins they have committed. It is up to you how soon you want to realize and which next lesson you wish to take from me. Therefore, do not feel disappointed, wake up and get on the next important lesson. Do not give up hope and maintain your peace and calmness. My spiritual guidance and help will reach you through this blog, I speak to you and the readers can connect with me through the regular entries here. All the answers will be received by them through this medium and they should hasten up their recovery and speed as fast as they can. He continued, “Those of you who have firm faith in me will realize that permanent peace and sustainable bliss is only possible when we clear our past baggage of bad karmas. Once the cleaning process is over, you shall attain permanent peace and wondrous joy which permeates your Soul. Until then, stay connected to Sarika, tell her about your dilemmas she will answer to all your personal as well as family problems and help you to withstand the difficult period. Difficult times are good as they teach us the most and once you are clean and pure you shall find peace within. Endure and clear up whatever you have accumulated as karmic baggage and receive divine peace and bliss from me. I shall never let you down. You are currently browsing the Spirit in life blog archives for the day Wednesday, August 10th, 2011.